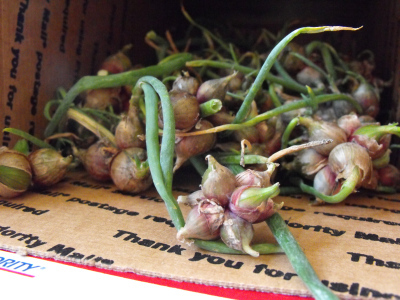 It's that season again --- time to send Egyptian onion top bulbs out to take over the world! I've already given away two brimming bagsful, but as you can tell, there are still plenty left. To be entered in our Egyptian onion giveaway, download Microbusiness Independence from Amazon today, then leave a comment on this post to let me know you've entered. I've set it up so our oldest ebook is free today and tomorrow, so this is a great opportunity to learn our tips on becoming financially self-sufficient. Rather than selecting only one winner, I'll choose five commenters at random to win a small flat rate box full of Egyptian onion top bulbs. This is enough to feed a large family all of the green onions they can eat, or to spread some starts around to your gardening buddies. Be sure to comment by midnight on Tuesday, June 12, and then check the comments on Wednesday to see whether you won. Our Egyptian onions are looking forward to exploring their new homes! Hello from a long-time lurker. I guess all it takes is the chance for Egyptian onions to get me to delurk? I've been wanting to try these for ages. I am a huge fan of your blog and your ebooks. Thank you! I would love to have some of these unique onions and look forward to reading through the download. I would love to try these onions if you have them to spare. Wow, that's a very generous offer. I've been meaning to get some of these but have put it off due to other needs in the garden. I've "purchased" the book, but won't be able to read it until my vacation next week. Just not enough time in the day to read what I want. I'm sure I'll get some great tips out of the book. I just hope that I follow through on them to start a secondary income stream. I'm not here to enter the giveaway, but I am here to let your readers know they should! I've already given away a bunch of bulblets and will soon be planting more. They're prolific! I do believe I could turn my entire garden into an onion garden. Thanks for getting me started! I won some starts from you last year and they are doing great. We've been eating the greens and pulling the occasional bulb to eat too. Love them. I've started spreading the word to my gardening acquaintances that I'll have some top sets to share soon. The little sets are about the size of a cranberry now. How shall I know when to cut them off? Do I cut the whole stalk? I'm not entering the giveaway this year by the way! 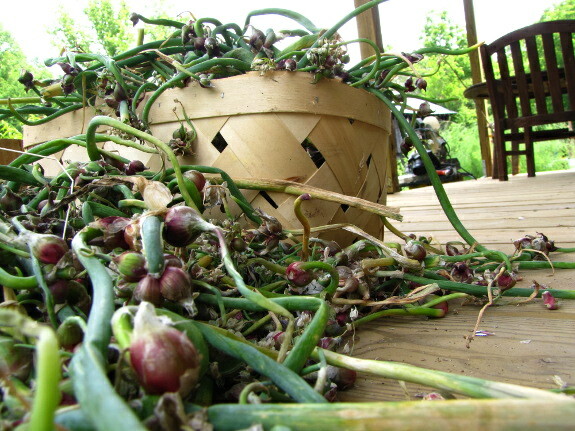 Thanks for the great gift of perennial onions! Thanks for the opportunity to win some free bulbs! I have been wanting to try onions, but not being sure if they will succeed haven't bought any sets yet. I look forward to reading the ebook, I love your Weekend Homesteader ebooks! I have been wanting to try these, but have been out of my price range for trying them. I hope to try some Potato Onions some time too. We just bought a 17 acre farm, and are just starting out, doing our best to be self sufficient...I would love some onions, or even better, any advice you have to offer..There is so much to learn!! I'm excited to have the e-book, as well as a chance to win the onions! Thanks for the give-away! Read your site every day. Woo Hoo! I've been keeping my eye out on Craigslist for someone locally who might have some to share and havn't come across any yet. Count me in. Thanks for the book too! I downloaded the eBook, and am looking forward to reading it. Would love some Egyptian onions for my fledgling garden! I've had the e-book for a while, so I'm hoping I don't need to download it again to enter the give-away! These look fantastic! 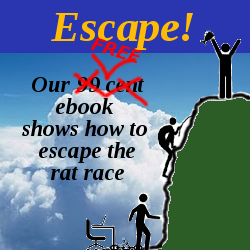 I downloaded your e-book, thanks for alterting us to the free offer! A chance to win egyptian onions too what a great deal! I can't wait to open it up and read! I've been collecting the weekend homesteader series and have to say that they are a delight to read! Thank you Anna! Thanks for the opportunity to win some of your prolific onions! I love reading your blog. Count me in! Thanks for the free download. I tend not to read books like that, but since you guys keep a relatively level head about these things, I'll give it a read. LOVE The weekend homesteader series, and I'm always learning good stuff on your blog. Thank you for both the free book and the opportunity to win these onions! I would love to give them a try (or rather, make my parents try it for me while I live overseas for one more year). Are Canadians allowed to play with everyone else? Dave --- I wait until the sets on top have started to sprout little green leaves, then I pluck just the bulblets off, separate them, and plant each bulb individually. That said, the stalks that bear the bulbs just die back after you pick the top bulbs, so it might be worth cutting them down. I'm experimenting this year to see if the stalks I cut down result in a faster return of green leaves than the ones I leave alone. Matthew --- I wish I could say we'll ship to Canada, but a quick search of the internet suggests I'd have to get the plants inspected to legally send them internationally. Sorry! I had bought the book some time ago, but this gave me inspiration to reread it. Good stuff. I got the book, don't know if I'm ambitious enough to start my own business. But I will read it, as I love your other books. I would also love some onions if I win. Thanks for your blog! I've downloaded your book but its on deck after my library books. I'm super interested in the egyptian onions. If I don't win, where can I get them? I downloaded your Microbusiness e-book. I have a small business of my own, but would like to make it grow. Thanks for providing the e-book and for the Egyptian onion giveaway! I purchased your book some time ago and found it to be very useful! I would love some of these onions! We are just about to move and looking for our dream homestead and this would be our first "crop" to be planted when we get there! Thanks for offering this Anna and Mark! I bought the eBook a few months back. Loved it, but have had no luck coming up with the 'thing' that I can sell to be independent. I think of myself as very creative, but I can't come up with anything lucrative or very unique. I don't feel confident I can ever come up with anything. I downloaded the book. Thanks for the freebies. I am going to download the ebook right now and look forward to reading it. I would also love to win some onions. I would also love to win some onions. Thanks for the chance!! I grow beds and beds of green onions, I eat them with, on, everything. They really get hit hard by the summer heat though. I have to sow new starts every fall. So how do these Egyptian guys handle the heat? I have always wanted them, but being out of stock has always been a factor. Thanks, Ill have to find some free time to read your book now..
Read parts of your book. Thank you again for the book..
What wonderful timing! Been wanting to download book for awhile. I now have vacation coming up at the end of the week and something to sit and read will be delightful. I have been eyeing egyptian onions every since your first post and would love to include them in my garden! Wow, a free book (thanks!) and possible onion starts...count me in! Kat --- They tend to be pretty expensive, unfortunately, but you can start with just a bulb or two and wait a couple of years to be overrun. I'd simply google for "Egyptian onions" and see what turns up --- I know there are lots of places out there selling them. Brandy --- I suspect some of us think in product mode more than others. Mark always has a dozen potential projects that we have to squash down until we (maybe, someday) have time to play with them. Maybe your product would be an ebook or something else outside the box? I've found that selling ebooks on Amazon produced half the income in the first year as our microbusiness. Not sure if the income will rise at the same rate as a physical product, but the ebooks do take less time. Egyptyumyonionygoodness --- We pick the greens nearly year round. Right now is the exception --- when they put up their top bulbs, the leaves die back and the main stalk turns a bit woody. But within a few weeks, new leaves will be popping up and we'll be snipping again! I'm still a fan of my Candy onions for bulbs, but really like the idea of being able to use these as green onions for so long. - Thanks for the chance to maybe try some! Thanks for the ebook, always a good read. Would love to try these egyptian onions. I have been looking forward to this since last year! I've been a reader/lurker for a long time, have read every post it seems. Also bought your chicken waterer a couple months ago for my 4 new backyard ladies ( they love it of course). Love your writing, and have learned so much. We are even looking into getting our own small plot soon here in Austin. I am in! Just downloaded and looking forward to reading. I would love a few of these unique onion bulbs to get started. Also thanks for all of your blogs! They are very educational. Just downloaded the ebook and quickly browsed through it. It looks like a wealth of great information and I will likely finish the book tomorrow. I was excited to see the opportunity to win the walking onions. A couple of years ago we moved and had to leave the walking onions we had growing. I am really looking forward to the opportunity to grow them and share them again. Thanks for all your great work and informative blog and ebooks. You make a very fine point, Anna. I had presumed that the lucrative thing would have to be an invention, but I'm not very good at those sorts of things. I will have to think on eBooks and consider where my niche could be. Thank you so much, your response really bolstered me. Brandy --- I keep meaning to update Microbusiness Independence to include my experiments with ebooks, but there are always so many other things I'd rather write about. Hi. I am in Malta, EU and looking for useful perrenial plants to grow. Walking onions! Please will you let me have some? The world needs these and I love onions. Jan --- Unfortunately, the giveaway ended June 12. Hopefully you'll find another source closer to you!